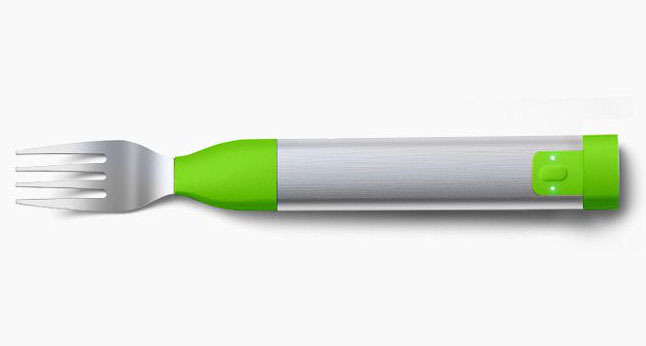 Fitting squarely in that tricky category of "products designed to save us from ourselves," the HapiFork is a chubby little utensil that aims to make you, well, less chubby. It's generally known that eating too quickly contributes to overeating, so the HapiFork detects the rate of your fork servings and vibrates if you're eating to fast. In theory, a fine mechanism for self-control - but in practice, there could be problems. Meals are social occasions, and using a product with such a stigma (and no good looks to save it) may be a nonstarter. Still, similar user-guidance has worked for Sonicare toothbrushes which time your brushing and beep to cue a move to the next quadrant of your mouth - so maybe there's hope yet!